A newborn rarely sheds tears while crying. The nervous control and emotional responses in the newborn are still under development. However the basal tears production is functional in newborns to keep the eyes functioning properly. 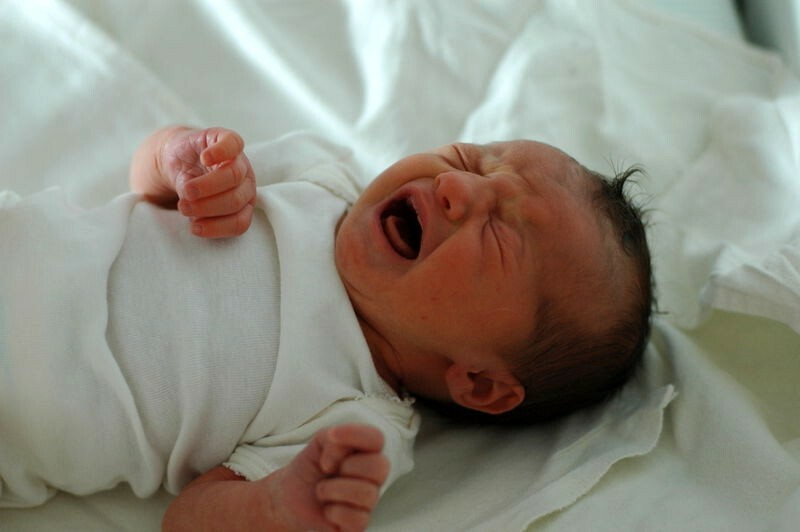 Crying by newborns is the only way of telling that they are hungry, uncomfortable, sleepy, feeling cold or bored. Crying is the only way to communicate their myriad of problems. After a few months of growth, with the development of the emotional responses and nervous control, they start shedding tears (lacrimation) while crying. To understand its physiology, we have to know the types of these eye secretions and the process of their formation. They are secretions from lacrimal gland, meibomian glands (or tarsal glands) and conjunctival goblet cells found in the eyes. Lacrimal gland secrete aqueous lacrimal fluid containing water, lipocalin, lactoferrin, lysozyme and lacritin. Meibomian glands secrete lipids and oils. Conjunctival goblet cells secrete mucin. Lacrimal secretions are produced continuously. With the blinking of eye, lacrimal fluid is spread over the eye surface. Lacrimation in humans, including newborns, is to clean, moisturize and lubricate eyes. There are three types of lacrimations namely basal, reflex and psychic lacrimation. The lacrimal gland is mainly responsible for producing emotional or reflexive lacrimation. In newborns, basal lacrimal production is functional, to keep the eyes moist, clean, lubricated and protected from bacteria. Lysozyme present in the lacrimal fluid helps in the destruction of certain bacteria. If s/he has crusted or sticky eyelids it is an indication of eye infection. Up to one ml of lacrimal fluid is secreted in twenty four hours. With old age the amount secreted may come down. Reflex lacrimal secretion results from irritation of the eyes by any foreign objects. The presence of any irritating fumes or vapors in the atmosphere may also induce the lacrimal secretion. Bright light and hot or peppery taste also induces reflex secretion in the eyes. Certain reflex functions like yawning, coughing and vomiting may also induce lacrimal secretions. In a newborn reflex lacrimal secretion due to all the above mentioned causes is present. Emotional and physical stress like anger, hurt feeling, mourning and pain and intense spasmodic cramps can increase the lacrimation and maintain a copious flow. Limbic system controls the basic emotional drives and via autonomic parasympathetic nervous system it controls the lacrimal glands. As the emotions and the connected nervous controls are still under development in a newborn, copious flow of psychic lacrimation is absent and hence s/he does not weep while crying. If a youngster, having started shedding lacrimal fluid while crying, persistently cries without lacrimal fluid with reddened eyes, it could be a sign of something more serious, like eye infection, problem with the function of lacrimal gland or dehydration. If the eyes are watering without actual crying, it is the problem of blocked or infected nasolacrimal ducts. An eye specialist will be able to evaluate the situation. If the blockage is due to infection, he may prescribe antibiotic drops. In newborns, tears ducts blocking is common and in most of the cases the ducts open up naturally after a few months. Newborn tears - Newborns rarely shed tears while crying.